← Thanks for a Great Year! Hello! I took a little break from blogging in order to move and also to onboard a sudden rush of new Alluvial clients. Now both tasks are mostly completed, and I’m back to talk about one of my favorite “growth” companies. Before I get into the specifics, let me take a little time to discuss what I mean when I say “growth” company. Most investors want the companies they invest in to grow. They want management to roll out new and improved products and service offerings, tap into new customer markets, and generally increase company profits and cash flow on a per-share basis. This typically requires diverting a portion of operating cash flow to capital expenditures and R&D, and investors generally accept this, as long as it’s done judiciously. What many investors dislike is when companies repeatedly raise external capital in order to fund acquisitions. There’s good reason for this. Many of these companies engage in acquisitions with no clear economic rationale, over-pay, then screw up the integration process. The end result is an enterprise worth the same or less, but with each shareholder’s stake diluted. So why does this happen? In my opinion, it’s because running a business and engaging in productive M&A activity are two different skillsets, and not every manager has both. Many successful executives who have done a great job building a business via organic growth start to believe they have the magic touch, and begin empire-building. However, there are some management teams that excel at both day-to-day business operations and at making productive acquisitions, and their track record shows it. One of these management teams leads GTT Communications. GTT operates a global fiber network that offers bandwidth and connectivity to a host of major companies and government organizations. GTT uses its network to provide a variety of internet services that make it easier for its customers to access remote servers and work seamlessly between locations world-wide. I’d be lying if I claimed to understand every last service the company offers, but it’s clear that these services are in great demand and increasingly essential for modern commerce and governance. Just how important these services are can be seen in how GTT’s revenues and profits have grown. Take a look at the quarterly revenue and EBITDA history stretching back to 2007. I don’t expect any slowdown in the growth in demand for GTT’s services for years and years to come. 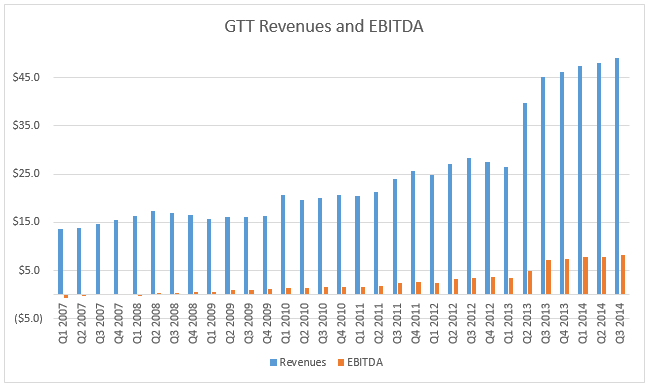 It might not be quite clear from the graph, but GTT’s revenues grew from just $13.7 million in Q1 2007 to $49.2 million in Q3 2014. That’s a compounded quarterly growth rate of 4.4%. Annualized, it’s 18.7%. Along the way the company went from near break-even to substantially EBITDA positive. The increasing demand for GTT’s services wasn’t responsible for the entire increase, though. You’ll notice a few sudden leaps in revenues from 2007 to now. GTT bought Colorado-based WBS Connect in late 2009 and Tinet in early 2013. Both of these acquisitions resulted in greatly increased revenues and improved margins, resulting from the company’s increased scale. Along the way the company also completed several other acquisitions, including nLayer and IDC Global. These acquisitions allowed GTT to broaden its service offerings and extend its reach globally. Because these acquisitions required additional capital, GTT has repeatedly issued equity and taken on additional debt. Any time investors see a pattern of capital raises, they should ask “was it worth it?” After all, growth for growth’s sake is often detrimental. If returns from acquisitions do not cover the cost of the incremental capital required, shareholders’ investment is impaired. In GTT’s case, the answer is unequivocally “yes, it was worth it!” GTT’s strategy of raising capital to fund acquisitions has resulted in all-important scale. In other words, the increased asset and revenue base has allowed GTT to realize increasing EBITDA margins and returns on invested capital. 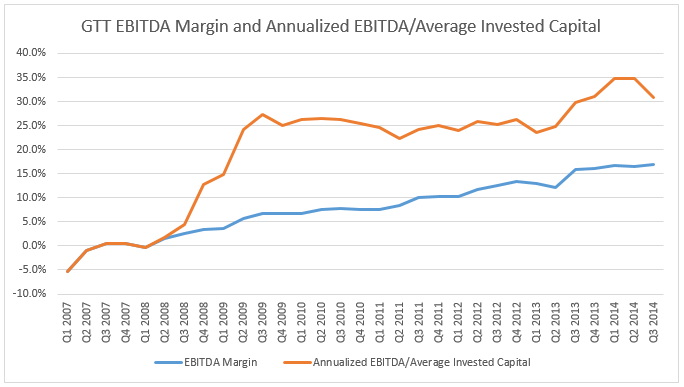 The chart below illustrates GTT’s EBITDA margin and annualized EBITDA/Average Invested Capital from Q1 2007 to Q3 2014. GTT’s EBITDA margin shows a steady climb from below breakeven to the mid-teens. Meanwhile, return on invested capital now surpasses 30%, indicating increasing capital efficiency. These are very, very healthy trends for a growing company and they support increasing equity values. And sure enough, equity value has increased. GTT shares went for $1.28 five years ago today, and are up almost ten-fold since. I have some theories as to why GTT’s acquisitions have been so successful, but before that, let’s talk about valuation. 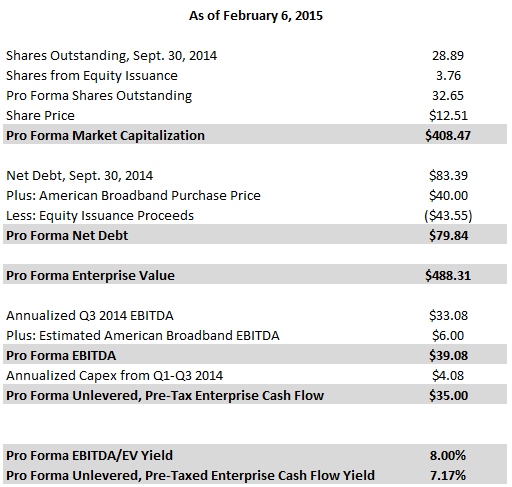 Readers will notice I’ve mentioned only EBITDA thus far, and not operating income or net income. There’s good reason for that, and it has to do with GTT’s business model. When GTT purchases another company, it records a large value for the acquiree’s intangible assets, like customer lists and relationships. These intangible assets produce large amortization deductions, even though little ongoing capital expenditure is required to maintain their worth. This is a big advantage at tax time! GTT’s amortization charges wipe out a large chunk of operating income. After interest charges, the result is negative taxable income, though the company’s free cash flow is positive. Here’s a look at GTT’s depreciation and amortization vs. capital expenditures over time, as well as free cash flow versus net income. That’s a lot of language and pro forma calculations to make a simple point. At the current market value, GTT offers a high single digit cash flow yield to the enterprise, even after accounting for capex. This wouldn’t be an unusual valuation, except for the fact that GTT’s organic revenue growth is nearly 10% and should remain so for many years to come. I am wary of valuing any company too generously, regardless of growth potential. Nonetheless, I think a yield of 5% would not be too aggressive, given GTT’s track record and prospects. That would equate to a share price of $18.99. A 6% yield would be $15.42. Now, back to GTT’s deal-making prowess. What is it that has made the company such a successful acquirer? In my opinion, it’s nothing more than a highly incentivized management team with a long history of entrepreneurial success in the sector. Prior to the recent equity issuance, GTT’s management owned about 35% of the company, worth many times their collective annual compensation. GTT management’s personal fortunes are closely tied to the value of GTT stock. This gives them all the reason they need to avoid empire-building and careless use of shareholder capital, and instead remain laser-focused on completing only the transactions that will truly increase GTT’s value on a per-share basis. Still, all the incentives and focus in the world are worth little if management simply lacks the talent for company-building through acquisitions. Fortunately, GTT’s leaders have strong pedigrees in the telecom industry. Between them, chairman/former CEO/largest shareholder H. Brian Thompson and current CEO Richard D. Calder, Jr. have spent time at MCI Communications, LCI International, Comsat International, Broadwing Communications and many other well-known telecom companies, all regular acquirers. I am confident that company leadership has a deep understanding of the markets that GTT serves and will continue to guide the company well. In nearly every earnings report and transaction announcement, GTT’s management mentions a clear revenue and EBITDA target: $400 million in annual revenues and EBITDA of $100 million. That goal is still a ways off, but I suspect they’ll achieve it sooner of later and shareholders will do well along the way. Alluvial Capital Management, LLC holds shares of GTT Communications, Inc. for client accounts. Do you know other public companies with the same business model? Level3 is a major competitor, and most large telecoms have a similar segment. GTT is one of the few pure plays in the industry. Cool article on the topic. Nice writeup, I looked at this and like the industry a lot but I definitely don’t know enough to tell if I’m on the right or wrong side of traffic (GTT appears to be on the wrong side). If net-neutrality holds then GTT should do well. Though from what I understand, if not for government protection I don’t think GTT would be very profitable if at all. Also, I think the average teleco is also cash-flow positive but with negative net income. That’s because the networks involved are extremely expensive to maintain but that maintenance comes in very high choppy waves. The depreciation costs are very real and if a company is not profitable with them then they are screwed if the next reinvestment cycle is more costly in real costs. Something to keep in mind. It does seem like both ATT and Verizon have some pretty incredible operating leverage on increased data usage either way. I love reading your blog, and I really like this idea but can’t seem to get around the fact that their GAAP-earnings are so depressed. Their cash flow from operations for Q1-Q3 2014 is (1,971). I read their january 2015 presentation and really like those numbers (non-GAAP) but can’t really get my head around why there’s such a big difference. Obviously, management ownership is a big, big plus, but how do you get comfortable with the different numbers; and why are non-GAAP numbers a better way to look at this? I understand that the reason this might be a good investment probably also stems from this issue. It’s hard to decode their “real” earnings, I think. The biggest reason the GAAP numbers don’t tell the whole story is because the amortization figures aren’t “real.” That is, they don’t actually represent an actual loss of economic value. GTT is constantly acquiring smaller companies, most of which have little in the way of physical assets, but lots of intangibles. As a result of these acquisitions, GTT capitalizes lots of intangible assets on its balance sheet. Many of these intangible assets are amortizable. That’s a huge advantage for tax purposes. GTT is able to shield nearly all its cash flow from taxation. It won’t last forever. At some point, GTT’s acquisitions will slow or stop, and not long after that it will run out of amortization charges. At that point, GTT will achieve GAAP profits and owe taxes. But as long as the company keeps growing at this rate, the phantom amortization will hide the true profitability. To add to what I said before, the GAAP figures and even the adjusted figures don’t tell the whole story because the company is growing so quickly and is so acquisitive. It incurs many one-time expenses like legal costs and stock offering expenses. If the company were suddenly to cease raising capital and acquiring competitors, both its GAAP figures and adjusted figures would suddenly leap. Thanks for the swift reply, Otcadventures. I guess my last question is how you get comfortable with the business model. I’ve read their 13F’s and even though I consider myself somewhat technical savy, I’m not quiet sure what they’re doing. It seems a lot more complicated than the swiss railroads you’re invested in (which I really like as well, if only it wasn’t for the decoupling of the swiss franc, damnit!). Haha yes, this business is quite a lot different than stuff like Swiss railroads! I’d say it’s the most difficult to understand business model that I’ve invested in thus far. GTT’s value is not in its physical network assets. It has some of those, but the actual value is in its ability to connect bandwidth consumers (companies and governments, mainly) with bandwidth and cloud service providers like Cisco, IBM and Amazon. There’s value in being able to provide exactly the right kind of connectivity nearly anywhere in the world, a lot or a little, short-term or long-term. Customers value this sort of flexibility and like the assurance that GTT can accommodate rapidly changing demands. But honestly, I would not have invested if not for the management team in place. They’re highly incentivized through their large ownership, and they have a clear track record of growing revenues and cash-flows. Not just in general, but on the critical per-share basis. Thanks for another clear reply. It made me comfortable with the business, but unfortunately I won’t have cash till monday and thing just popped on a new major acquisition. Oh well. 🙂 Very interesting company – and espescially management – for sure. Might jump along for the ride. I began reading your web postings about a year and a half ago. I think you do an excellent job of finding out of the way companies that are worth looking at. With regard to GTT, the management gives minimal information why their SGA increased at a greater rate than revenues last year. Indeed, management says relatively little about the financials (MD&A). I have no problem doing my homework, but some more information from the company would be helpful for current and potential investors. That said, I have a small position in the stock. I suspect a large part of the SG&A expense growth is share-based compensation and transaction expenses. The stock has been on an absolute tear and they have undertaken multiple large transactions, so legal and compensation expenses will be elevated.